alaTest a collecté et analysé 222 avis de consommateurs et d'experts pour le produit Kärcher SC1. La note moyenne du produit est 3.9 sur 5, tandis que les autres produits de même catégorie ont une note moyenne de 4.2 sur 5. Les testeurs apprécient l'ergonomie. Après analyse des notes de consommateurs et d'experts, de l'âge du produit ainsi que d'autres facteurs, et comparé aux autres produits de même catégorie, le Kärcher SC1 obtient un alaScore™ de 90/100 = Excellent. 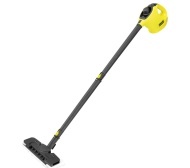 The Karcher SC1 Steam Stick is a lightweight steam cleaner that can be used as a steam mop – by adding the extension tubes – or as a handheld cleaner for detailed jobs. The Karcher is an impressive, versatile little dervish of a steam cleaner. The Kärcher SC1 Steam Stick is a lightweight steam cleaner that can be used as a steam mop – by adding the extension tubes – or as a handheld cleaner for detailed jobs. The Kärcher is an impressive, versatile little dervish of a steam cleaner. I bought the product a week ago and it's quality is excellent. Used once the steam lasted less than a minute, left loads of water on the floor and the cap was difficult to remove. Returned the steamer the next day. It's not bad for it's size Ideal for small jobs as the steam doesn't last for long, so for a big floor area you would have to keep refilling. Need to let it heat up enough so it's just the steam coming out and not water and don't overfill. Love this steamer doesn't hold a lot of water but it's so light and easy to use I don't mind filling it up! We have 4 floors and I have a couple of these ! The usual Kärcher quality. Absolutely brilliant, I've cleaned my carpets and managed to finally get rid of all the stubborn stains. Highly recommended. Just bought this and so far I am very impressed. Easy to use and steams leaving a fresh feel.